Eagle Beach, Aruba. One of the top beaches in the world, and everybody’s favorite beach in Aruba. Are you still wondering which Caribbean island to visit? Here are a few reasons why to go to Aruba! 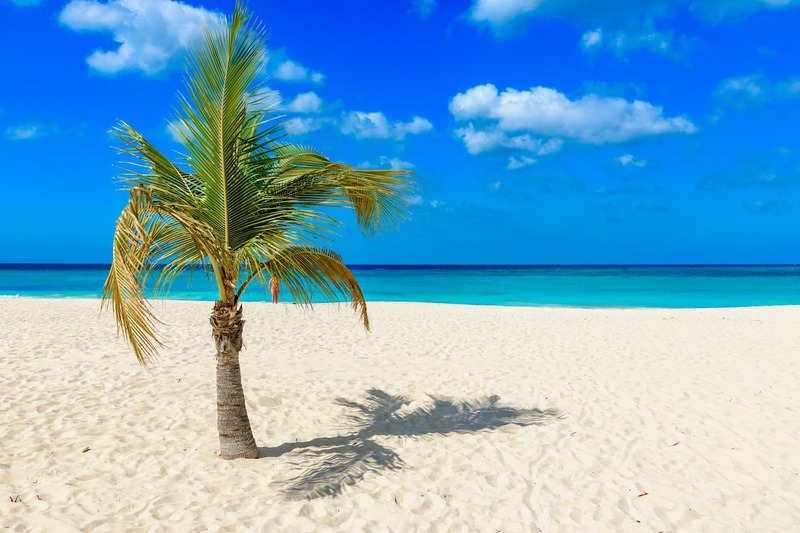 Aruba beaches are considered to be among the cleanest, and most beautiful in the Caribbean. They are the number one reason why people go to Aruba. They come in a wide variety too: ranging from the wild beaches on the north-east coast to the classic Caribbean beaches with perfectly bone-white powdery sand and turquoise waters near the high-rise hotels. Just check out Eagle Beach, one of the best beaches of Aruba, and you’ll see what we mean. These 25 beaches alone are enough reasons to go to Aruba. Did you know that Aruba has more sunny days than any other island in the region? Aruba weather is dry with average temperatures of around 80 degrees Fahrenheit and constant cool trade winds. The air’s humidity is 65 percent on average. Aruba is located outside of the hurricane belt, so visitors don’t have to worry about hurricane season. Sure, rain showers do happen on Aruba – but they’re actually enjoyable, especially while snorkeling or swimming. And it’s only just a few inches of rain per year! It’s great to get out and explore the island, there are tons of things to do and places to visit that are great fun for both adults and kids. Nature fans will appreciate Arikok National Park, perfect for exploring the ancient caves and natural pools. You can go kayaking, paddle boarding, and jet skiing. Hiking and biking trails are scattered across the island. And let’s not forget, thanks to the constant trade winds, Aruba is one of the world’s best places to go windsurfing, kitesurfing and parasailing. So if you like water sports, there’s your reason why you should go to Aruba. Scuba diving? Aruba’s got your back. Along the southern coast of Aruba, you’ll find 20 dive sites, including 11 shipwreck sites. Snorkeling can practically be done at any beach. Just add snorkel. What about food? With over 100 restaurants on the island, Aruba is a paradise for foodies. The variety of culinary options is large and ranges from fast-food places to restaurants serving dishes based on organic ingredients or gluten-free, vegetarian and vegan ingredients. The island is also home to the largest seawater distillery plant in the Caribbean, the locally distilled water is absolutely delicious and safe to drink, or use to make your coffee and tea. Did you know that Aruba water serves as the base for the locally brewed Balashi beer? More and more Aruba accommodations are committed to the environment and care about sustainability. Within 10 years, it is expected that all of Aruba’s energy will come from renewable sources. Currently, 20 percent of Aruba’s electricity is generated by wind turbines. Several accommodations host a beach cleaning day each month, where both employees and guests are welcome to help keep Aruba’s beaches pristine. Aruba is safe for both travelers and residents. Thanks to Aruba’s growing tourism industry – resulting in a strong economy – Aruba doesn’t have to deal with economic issues seen on other Caribbean islands, such as poverty or high unemployment rates. The island is safe to explore, either by walking or driving, thanks to its modern infrastructure. Queen Beatrix International Airport is modern and handles travelers professionally and efficiently. On the island, reliable utilities are provided for. Communication technologies too are up-to-date and state-of-the-art. Aruba’s hospital is modern as well and well equipped to deal with any medical issues or emergencies. As you very well may know, Aruba, Bonaire and Curaçao are often referred to as the ABC Islands. Bonaire is located just a mere 86 miles east of Aruba, and Curaçao is located approximately 70 miles east of the island. These short distances can be covered with only a 30-minute flight, and make a day trip to Bonaire and a day trip to Curaçao easy as 1-2-3. When you visit Aruba, one of the best experiences to have on the island is to swim among the corals and explore the rich marine life, either by snorkeling, scuba diving or snuba diving. Both the marine life and diving sites are incredibly diverse, from shallow waters near some of the beaches, to steep drop-off reefs, and to large shipwrecks such as the SS Antilla, which is still intact. Several dive operators on the island offer PADI- or SSI- introductory courses, making Aruba a great place for both beginners and experienced divers. Ever dream of winning the grand prize or hitting the jackpot? Visit Aruba and you’ll know you’ve come to the right island to try your luck! How about playing a few games of blackjack, roll the dice at the craps table, or try your luck on a few slot machines? In Aruba’s casinos, you’ll have tons of opportunities to win big. For example, the Divi Resorts Alhambra Casino boasts nearly 500 slot machines and a wide range of table games. Furthermore, games such as Bingo for Cash, several tournaments, cash giveaways and other casino events will keep you entertained for days and nights on end. Most casinos in Aruba are open daily from 10:00 a.m. – 4:00 a.m.
Aruba’s accommodations are not just about the all-inclusive resorts and casino resorts near Palm Beach. There’s a small collection of boutique hotels scattered across the island that caters to both families with kids and adults. These small hotels often combine a hip interior design with a refined service and offer guests genuine comfort, intimacy, and Caribbean originality. Another good reason to visit Aruba, also known as “One Happy Island,” is that it is one of the happiest places on earth. And there’s actual science to back up that claim. A five-year study on the index of happiness, conducted by the Aruba Tourism Authority and the University of Central Florida, has revealed that Aruba is the happiest island in the world. 78% of the population is satisfied with their living conditions, a rate which is higher than in Denmark, with 75.3% of the population saying they were “happy” to live there. This high incidence of happiness is a result of the hard work of the Aruba Tourism Authority. By proactively promoting the island and focusing on its authenticity, stayovers increased and the economy kept on growing. As a result, the inhabitant’s income increased as well, leading to a higher standard of living. The hard work of the ATA has been a significant source of inspiration for other Caribbean islands such as Bonaire and Curaçao.